Most people with a serious interest in traditional American fiddle music will be familiar with Rounder's North American Traditions series, established in 1999 and largely devoted to releasing recent field recordings made by dedicated collector Mark Wilson during the 1980s and '90s. At a time when older styles of fiddling were supposedly dead Mark proved otherwise - as he is the first to admit, he was collecting the last remnants from a disappearing generation, but there was still a surprising amount of it around at the time. Unfortunately, with the decline of the CD and the growing commercialisation of the Rounder enterprise, most of these recordings are either no longer in print or are only available as downloads in the inferior MP3 format and without the accompanying documentation which was always a crucial feature of the NAT series, reflecting their core belief that 'traditional music is best appreciated if it is understood in terms of the people and societies that have produced it'. To remedy this situation Musical Traditions has begun re-releasing the series on CD under its own label and with the original booklets. Over the Cabot Trail by Cape Breton 'Scottish' fiddler Morgan MacQuarrie is the third in the project. Every NAT CD I've heard so far has been quite outstanding in both the quality of the music and the documentation, and this is no exception. The content follows the same general outline as the others: an excellent old-style fiddler who learnt his music from family and neighbours of an older generation, playing for and known only within his own community, and playing driving and energetic music which prioritises the dance pulse. 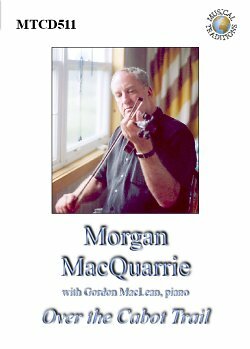 In one respect, however, Morgan MacQuarrie differs from the norm: he is a baby boomer, born in 1946, and at the time of these recordings he was only in his early 50s - some 20 to 30 years younger than the typical NAT fiddler. To put that another way, he is the same age as the typical post-war folk revivalist. Most of his contemporaries in Cape Breton looked down on traditional music as backwoods, hick, and irredeemably old fashioned, turning instead to Rock'n'Roll or Nashville Music. The few with an interest in traditional music tended to see it more in terms of preserving 'heritage' or asserting ethnic/regional 'identity' than of simply going out drinking, dancing and having fun. These people tended to align themselves with the urban folk revival, and fused its guitar based music with a more upmarket form of Cape Breton fiddling, based on classical technique and the smoother modern styles of the fiddle competition circuit and of professional recording and media stars like Don Messer and Scotty Fitzgerald. In total contrast the teenage Morgan took to hanging out with a crowd of local reprobates 20 years or more older than himself, to whom the old fashioned music was inextricably associated with what he calls "cutting up and blaggarding". He is politely scathing about the 'identity' approach ("
") - in contrast Morgan and his mentors "
were just trying to have a good time". Attitudes to music are rarely shaped by a purely objective response to its intrinsic beauty (or lack of). Music exists in social contexts and has deep associations that can turn people for or against a particular form or style for reasons that have nothing to do with its intrinsic merit. For many people throughout the world, older forms of traditional music rooted in pre-industrial or rural cultures are irredeemably tainted by association with poverty and 'backwardness'. From within such societies this can lead to several reactions. Probably the most common is outright rejection, typical of Morgan's generation in Cape Breton. Another is to create and patronize a modernized form of the music moulded by the aesthetics and values of contemporary urban popular music. In eastern Canada in the 1940s and '50s this gave rise to the styles associated with players like Scotty Fitzgerald and Don Messer, who fused traditional music with a swing derived pulse. The 1960s CBC series 'Don Messer's Jubilee' was the showcase for this music, presenting it in a pop cultural matrix where sentimental kitsch rubbed shoulders with authentic music and dance, and virtuoso fiddlers played with a swing rhythm section. This was a style most associated with Morgan's parents generation, but in Cape Breton from the mid '60s onwards a younger generation produced a similar blend of urban revivalist 'Folk' (later 'Celtic' ) music and the local traditional music, sometimes with a rather heavily contrived rock influence, and generally even further away from the older music than the Messer style.
" (the Dionysian aspect of older traditional music isn't emphasised enough in my opinion, and ironically makes it spiritually much closer to modern urban dance music than the allegedly more modern 'Folk' and 'Celtic' scenes, which at times manifest a quite puritan ethic). So, what constitutes his 'old' style? Readers familiar with authentic traditional fiddling from almost anywhere in Europe or North America will understand right away what to expect of Morgan's playing: a dynamic and driving approach that emphasises rhythm and volume over tone and cleanness, and with much use of double stopping, drones and unisons - plus plenty of the heavy birling that is such a feature of older Scots fiddling. articulates his melodic line into sharply individuated blocks often creating the impression of two voices answering one another'. In fact all a player like Morgan is doing (and the 'modernists' aren't doing) is emphasising the way the tunes are actually constructed. While any melody could be said to be based on 'groups of contrasting phrases', in traditional European dance music the element of contrast is highly developed and very important. For example, much Scottish music is constructed on the so-called 'double-tonic' principle - as is a lot of the older dance music from all over the British Isles, especially that associated with the bagpipe. Double-tonic tunes give the impression of having two tonics, usually a tone apart (in its simplest form exactly the same phrase is repeated a tone apart, e.g. Drunken Sailor, Irish Washerwoman) creating a feeling of conflict and resolution, call and response. Often they feature interweaving pentatonic scales, and heard against a constant bagpipe drone this gives a feeling of actual chord and dischord - the result of the tonic triad harmonizing and the higher or lower triad clashing with the drone. Although the violin gives a variable drone, a good fiddler can still produce this tension, and Morgan's careful phrasing gives life and meaning to these tunes in a way the modernist approach never can. Morgan's actual repertoire is a pot-pourri of the last 300 years, typical of Cape Breton generally, and directly comparable to that of mainland Scottish fiddlers. Probably the oldest tune on the album is Killiekrankie, which first appears in the 1694 manuscript collection of Northumbrian fiddler Henry Atkinson, only a few years after the battle which it commemorates (1689). Many of his strathspeys and reels were first printed in the 'Scotch' music boom of the late 18th/ early 19th centuries: some possibly quite old at the time (High Road to Linton, Bogan Lochan) others the work of period composers like Niel Gow, William Marshall, Isaac Cooper and Robert and Abraham Mackintosh. There are also several Victorian and 20th century tunes, some the product of the Pipe Band movement: in fact the first tune Morgan learned as a boy was the classic 2/4 pipe march Donald MacLean's Farewell to Oban, composed by Archie MacNeill in 1938, and he gives an excellent rendering of it here. Finally, there are a number of tunes by modern Cape Breton composers in the traditional idiom. There are also several sets of 6/8 tunes - a lot more than might be expected in the equivalent repertoire from a musician of similar background in Scotland itself (for example, there are no jigs at all on Peter Kennedy's classic Folktracks cassette De'il in the Kitchen, recordings of traditional fiddlers made in north-east Scotland during the 1950s). This is something I have noticed before in Cape Breton recordings, and according to Mark Wilson's notes it reflects the popularity of quadrille dancing on the island, many of these 6/8 tunes being recent local compositions created to fill the void in the heavily 4/4 and 2/4 Scots repertoire. Morgan's approach to jigs is quite different from that generally prevailing in modern Scottish music, in that they are played fairly slowly, and with very little pointing - each note in a group of three quavers will be given equal or almost equal value. This is almost a reversal of the heavily accented approach to the 2/4 and 4/4 tunes. This seems to be normal with older players on the island, and can also be heard on the solitary solo piano track by accompanist Gordon MacLean. This is essentially a bookish repertoire, as is typical of both modern Cape Breton and Scots fiddling generally, but it is interesting that Morgan learned it entirely by ear and cannot read a note of music. If you compare, say, his playing of Donald MacLean's Farewell with the printed pipe setting he clearly has a very fine ear for detail and reproduces the original setting very closely. I suspect this keen and careful ear may not be that unusual within a culture where the printed page is deeply respected - Morgan confesses he considers it important to have a tune 'correctly', and apparently worries that this is not always the case. It's hard to imagine the average Appalachian or southern English musician reproducing a tune like Donald MacLean's this accurately, or even trying very hard to do so: more likely they would effectively transform it into a new piece, and lose not a wink of sleep over the fact. The only criticism I can make of this disc is more a sin of omission than commission. It would have been nice to hear a couple of tracks of Morgan playing totally solo. Cape Breton fiddlers like to play with piano accompaniment, and true to form every track is accompanied by Gordon MacLean on piano - and a fine player he is too, no criticism of him intended. But Morgan's dance style is inherently driving and rhythmic, the piano is an extra not an essential, and it would have been interesting to hear just a bit of his playing unadorned. Anyway, let's conclude by simply observing that this is seriously good music and a real pleasure to listen to. This is pre-eminently dance music, but like all good dance music it is subtle and exciting music that you can happily just sit down and listen to. For anyone who appreciates first class Cape Breton, Scottish or simply 'old time' fiddling it falls into the 'essential' category, so dig deep and buy!